AJ Styles is arguably one of the best wrestlers in the world. His name is known to all the wrestling fans in the world. The Phenomenal One carried Impact Wrestling (formerly known as, TNA) on his shoulders for over a decade. Styles then went to NJPW, where he became the leader of the famous "Bullet Club" and had a fabulous run there becoming the IWGP Heavyweight Champion. In January 2016, amidst rumors of him coming to WWE, Styles debuted at the Royal Rumble as a surprise entrant. Since then, he's been on a roll. In his relatively short career of three years in WWE, Styles has already achieved a lot. He's a two-time WWE Champion (the recently concluded one was 371 days long) and has also held the United States Championship. Not to forget, he feuded with the Leader of Cenation and pinned him clean at SummerSlam '16. The 2k19 cover star had a memorable 2018, having some great rivalries and matches. He recently challenged Daniel Bryan for the WWE Championship at the Royal Rumble unsuccessfully (thanks to Rowan). Currently, he's scheduled to be a part of the Elimination Chamber match for the WWE Championship along with Randy Orton, Jeff Hardy, Samoa Joe, Mustafa Ali, and of course, the WWE Champion Daniel Bryan. Though we can never rule out a Styles victory, the chances of that happening are less. But rest assured, a Superstar of the level of AJ Styles is sure to have a solid feud and match at the Grandest Stage Of Them All. 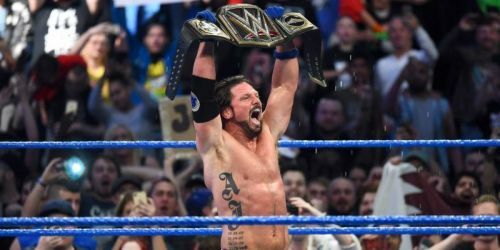 So let's take a look at the three possible matches that AJ Styles can have at WrestleMania 35. Feel free to tell us your thoughts on these matches in the comment section. The Viper vs The Phenomenal One! Let's start with the match that has been rumored to take place at WrestleMania 35 since quite some time now. This match has happened once during the build-up to WrestleMania 33. Randy Orton, who was a babyface then, defeated Styles, who was a heel. With the dynamics changed now, a feud between the two would be very interesting. Styles is a top-notch babyface and Orton's new, more vicious attitude would keep fans invested in the feud. Both of these Superstars are competing in the Elimination Chamber for the WWE Title. While neither of them might walk out as the champion, but they could kickstart their feud inside the chamber. Imagine Styles jumping from the top of the pod to deliver a Phenomenal Forearm to Orton, who counters it into an RKO mid-way. Styles can then go on to eliminate Orton afterwards, making Orton angry and attacking Styles on SmackDown. This match was initially supposed to be the WWE Championship bout at WrestleMania 35. Though it could still happen, title or non-title, this rivalry has the potential to be one of the best rivalries of the year. Also, just a wild thought - With the rumors of AJ Styles not renewing his contract with WWE and AEW approaching Randy Orton, adding a "loser leaves WWE" stipulation to the match would make it one of the most anticipating matches of this year's WrestleMania. Following is a recent tweet, where Orton is taking shots at Style's rumored injury.